Pest monitoring Infestations usually begin on lower leaves of plants, then progress upwards. Inspect lowest leaves for stippling and webbing first. Avoid early season applications of insecticides, which will reduce populations of beneficial insects. Spider mite infestations are favored by dry, dusty conditions, so avoid creating these problems and stressing the plants. Excessive nitrogen fertilization may cause population buildup. Home gardeners can wash plants with a strong stream of water. 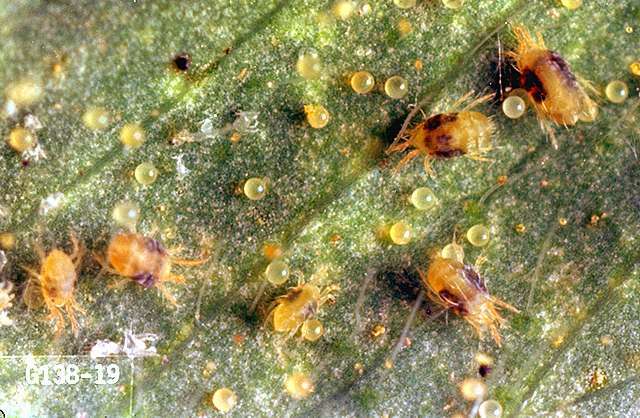 Spider mite populations commonly are kept under control by predator mites. Spider mite outbreaks are not uncommon following an insecticide application for control of other insect pests. Release of commercially available predator mites to prevent spider mite outbreaks deserves further testing. insecticidal soap-Apply when mites first appear. Thorough coverage, especially to undersides of leaves, is essential. Some formulations are OMRI-listed for organic use. Plant-derived essential oils (such as clove, garlic and rosemary) have efficacy against spider mites. Some formulations are OMRI-listed for organic use. abamectin (Agri-Mek, Epi-Mek 0.15EC) at 0.009 to 0.019 lb ai/a for low to moderate infestations and 0.019 lb ai/a for severe infestations. PHI 7 days. REI 12 hr. Retreatment interval 7 days. Limit two sequential applications per season. Do not exceed 0.019 lb ai/application or 0.056 lb ai/a per year. bifenazate (Acramite 50WS) at 0.375 to 0.5 lb ai/a. PHI 3 days. REI 12 hr. Do not exceed one treatment per season. bifenthrin (Brigade WSB, Sniper) at 0.08 to 0.1 lb ai/a. PHI 3 days. REI 12 hr. Do not exceed 0.3 lb ai/a per year. Do not make more than two applications after bloom. Retreatment interval 7 days. bifenthrin /avermectin (Athena) at 0.09 to 0.12 lb ai/a. PHI 7 days. REI 12 hr. Retreatment interval 7 days. Do not exceed 0.35 lb ai/a Athena, 0.056 lb ai/a avermectin, or 0.3 lb ai/a bifenthrin per season. bifenthrin/zeta-cypermethrin (Hero) at 0.1 lb ai/a. PHI 3 days. REI 12 hr. Retreatment interval 7 days. Do not exceed 0.4 lb ai/a per season. Limit 2 treatments after bloom. etoxazole (Zeal) at 0.09 to 0.135 lb ai/a. PHI 7 days. REI 12 hr. Do not exceed 1 treatment per season. geraniol/ citronellol/nerolidol/farnesol (Biomite) at 1 to 1.25 quarts/100 gal formulated product. REI 4 hr. fenpropathrin (Danitol) at 0.2 to 0.3 lb ai/a. PHI 7 days. REI 24 hr. PPE required. Retreatment interval 7 days. Do not exceed 0.8 lb ai/a per year. fenpyroximate (Miteus) at 0.1 lb ai/a. PHI 1 day. REI 12 hr. Retreatment interval 14 days. Limit 2 treatments per year. Do not exceed 0.21 lb ai/a per crop cycle. Isaria fumosorosea (PFR-97 20% WDG) at 1 to 2 lb/acre of product. REI 4 hr. Retreatment interval 3 to 10 days. OMRI-listed for organic use. lambda-cyhalothrin (Warrior II) at 0.03 lb ai/a (suppression only). PHI 1 day. REI 24 hr. Retreatment interval 5 days. Do not exceed 0.18 lb ai/a per season. malathion (Fyfanon 8) at 1.0 to 1.75 lb ai/a. PHI 1 day. REI 24 hr. Retreatment interval 7 days. Do not exceed 2 treatments. pyridaben (Sanmite) at 0.188 to 0.28 lb ai/a. PHI 1 day. REI 12 hr. Do not exceed 0.56 lb ai/a per season. Limit 2 treatments. Retreatment interval 30 days. Greenhouse Only. spiromesifen (Oberon 2SC) at 0.11 to 0.13 lb ai/a. PHI 7 days. REI 12 hr. Do not exceed 0.4 lb ai/a per season. Retreatment interval 7 days. Limit 3 treatments.